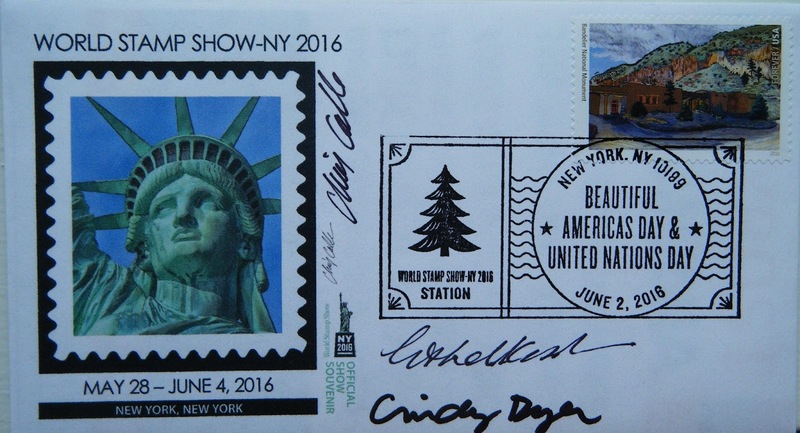 I was lucky enough to make it to the NYC 2016 world stamp show, where I attended the National Parks stamp dedication. The cachet on this FDC was created by the ATA, and I applied this park stamp from a pane of 16. The stamp is from a pane of 16 parks, and is of a mid-1930s Helmuth Naumer pastel of the current park's visitor center in Frijoles Canyon. Issued: June 2 2016. Thank you Jocelyn! A postcard with an image of a multi-story dwelling, with beam holes carved into tuff. Bandelier is a protected area encompassing more than 33, 000+ acres of settlement and land of the ancestral puebloans. Named for an anthropologist, Bandelier is one of the many parks that has Woodrow Wilson's forethought to thank. The majority of the settlements date from 1150-1600.